What is the correct way to use de.slisson.mps.tables with MPS 3.2 or MPS 3.3 respectively? I tried pretty much all combinations and available links one can find to download the plugin and install it with MPS 3.2 and MPS 3.3 Rc1 respectively. I read here: https://github.com/slisson/mps-all/wiki that the plugins are part of embeddr now (from 3.3). Does this mean they are not usable anymore without embeddr? Probably not. https://github.com/slisson/mps-all/releases/download/v2.0.0/mps-sl-all-2.0.0.zip (I do not know how to get the tables plugin imported into MPS properly; when I copy the plugin folders into MPS and restart, I can import the language, but it is not recognized, i.e. I cannot create table projections, there is nothing table-related in my code completion list). I also tried to download the sources and build the plugin myself, without success. In MPS 3.3, when I get the latest and greatest mps-all from here: https://build.mbeddr.com/viewLog.html?buildId=7802757&tab=artifacts&buildTypeId=Mbeddr2_Build_BuildSlAll, I never get into a state where all the necessary plugins work with MPS 3.3 Rc1. 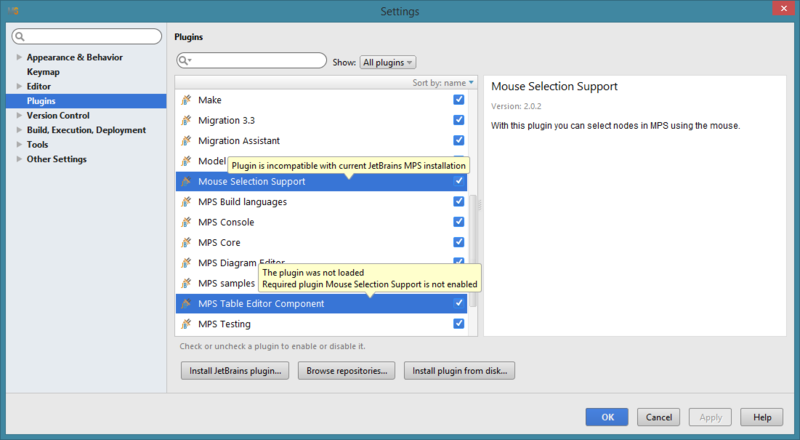 Either, a dependent plugin does not have the correct version for this installation of MPS, or soe plugin is missing, etc. pp. Maybe someone can provide me the "right" way to get the plugin working in MPS (3.2 or 3.3, I don't care). As a feedback to the creators of mps.tables: I think this is an amazing plugin, but it is beyond my comprehension why you are not trying a little harder to make this technology available to a broader audience? Would it be possible to provide a MPS distribution with the richtext/multiline/tables plugins? Thanks for the reply Sascha. I used the Windows installer for MPS. I will try again with the zipped package, but the download is taken another three hours. This is fixed the the latest version. Download the plugins again and it should work. Yeah, it does not work... still getting the same errors. Do I have to use another link to get the latest version? I re-installed MPS 3.3 RC1, copied the plugins, same result as posted before... Does it really work for you?